A few months ago, a company called LastLine Labs published some explosive data about antivirus products. They studied hundreds of thousands of pieces of malware for a year, and tracked the antivirus detection rates of each "engine" using Google's Virustotal site. This allowed them to figure out how fast (or rather how slow) AV scanners catch up with new malware. The results are like a hand grenade thrown into the AV space, it is a blood bath. I'm an industry insider and I was still shocked to see these numbers. 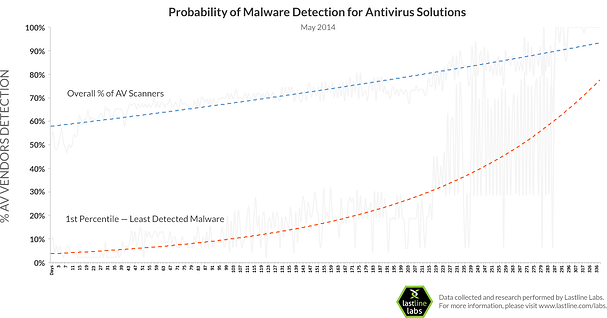 It takes an average of two days for at least one antivirus scanner to detect a new malware sample. The numbers are confirmed by another company called Damballa, who during a nine-month period, analyzed a sample set of thousands of files delivered for review by enterprise customers and had it scanned by four of the most popular antivirus products currently on the market. The company found that in the first hour from submission, only 30% of the malware database could be identified by the products as a threat. After a day, the detection rate increased to 66% and the improvement continued after a week, when 72% of the malicious database entries were labeled as a threat. It is no wonder that antivirus cannot keep up. 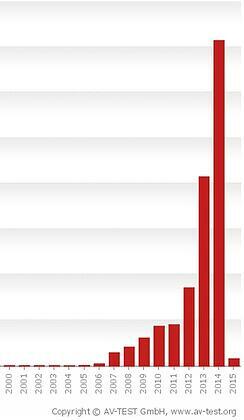 AV-test estimates a whopping 12 million new malware variants a month. This analysis based on data from the AV industry insider site Virustotal definitely shows that “traditional” AV technology is not dead but it cannot keep up with the onslaught of almost 400,000 new malware samples per day. AV needs to be complemented with other approaches. End-user security awareness training is an obvious additional layer, but application whitelisting (a.k.a. Application Control) is a technology that at this time should be layered on top of AV.